How to get away in December..without going away! During the last two weeks of December, vacation “hot spots” around the world are high in demand. You can find special offers for vacations in Miami, Cancun, Barbados, etc. – if you book your flight way in advance and if you can afford the steep prices. But those of us who are committed to Torah and Mesorah have our own getaway – right here in Toronto. 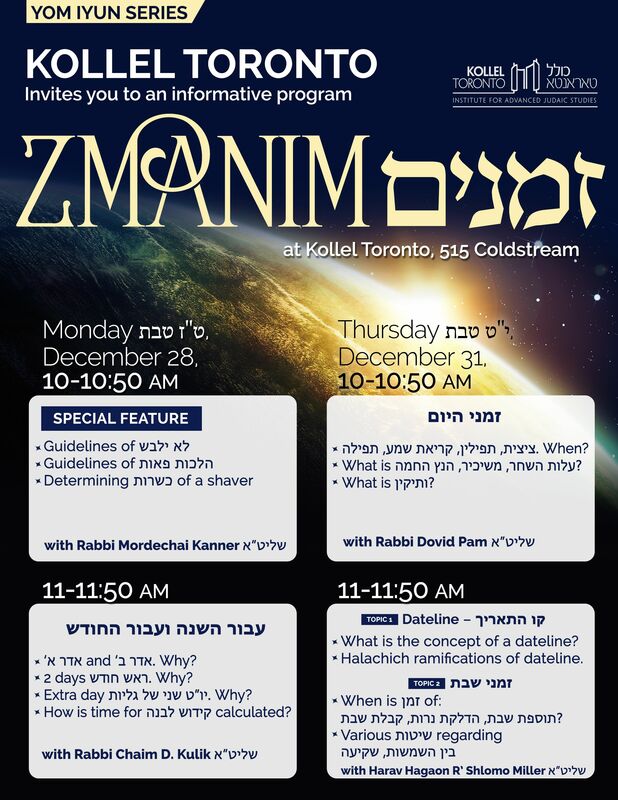 For several years now, about fifty young Toronto businessmen have made their way to a special “hot spot,” the Yarchei Kallah program at Kollel Toronto on Coldstream Avenue, for a few days of exciting learning and growth. The Yarchei Kallah program invites you to join us for a vacation of mind and spirit. We will make every effort to find you a compatible chavrusa. 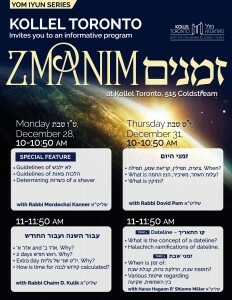 The highlight of the program is the Daily Shiur given by different guest Rabbis. They begin the shiur each day by reviewing the Gemorah text with Rashi and Tosfot, adding clarity to each sugyah. He then proceeds to an in-depth analysis – an Iyun of the mare’h mekomos in the handouts. The lecturers possess a unique ability to transform complicated ideas into simpler terms and to deliver profound ideas in an organized and inspiring fashion.